After dropping layers of clothing finally we can reveal what lies beneath. 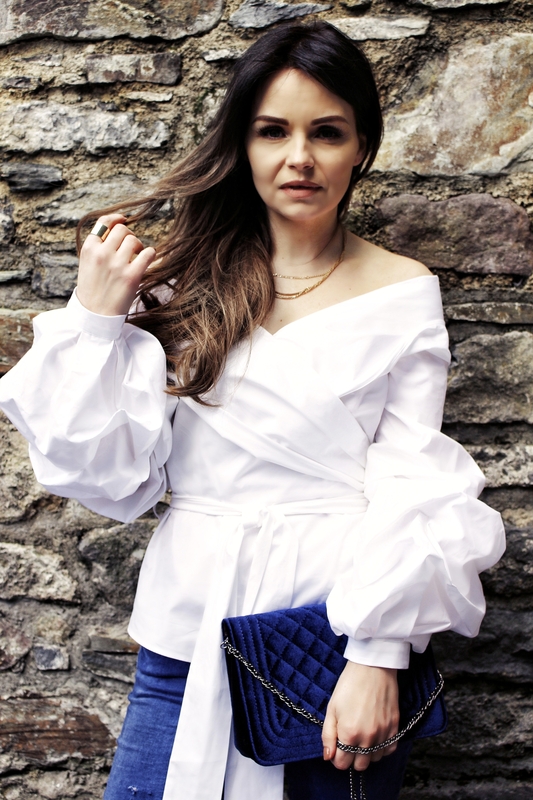 Bare shoulders, statement sleeves and ruffles are the key pieces for this season. Nothing else could represent these SS17 trends more, than this beautiful shirt from ASOS. Crisp white fabric, fold over shoulders, belt to accentuate your waist and ruffled sleeves makes this piece unforgetable. I recently found a pair of plain denim trousers in my wardrobe in this vibrant blue colour and as I love customized pieces, I decided to make them more unique and create a ripped effect with a pair of scissors and a cheese grater. Here is a final result: If you would like to buy a similar pair of denims, look no further than BOOHOO. Continuing with more ruffles I chose faux suede heels from EGO in soft blush colour. To keep it stylish I added a velvet quilted chain BAG and sleek metal framed SUNGLASSES.